1.Preheat oven to 325°. Remove ham from packaging. Place ham, cut side down, in 13 x 9-inch metal, glass or ceramic baking pan; cover loosely with aluminum foil. Bake 1 hour. 2.Meanwhile, in small saucepan, heat preserves and rum over medium heat until mixture begins to simmer; simmer 10 to 12 minutes or until glaze thickens and is reduced to about 2 cups. Remove saucepan from heat; stir in mustard, ginger, salt and pepper. Makes about 2-1/4 cups glaze. 3.Remove ham from oven; set aside aluminum foil to use later. Spoon some glaze over ham, then return ham to oven. Bake 45 to 55 minutes longer or until internal temperature reaches 120°, brushing ham every 15 minutes with additional glaze. Remove ham from oven. Carefully place ham on serving platter. 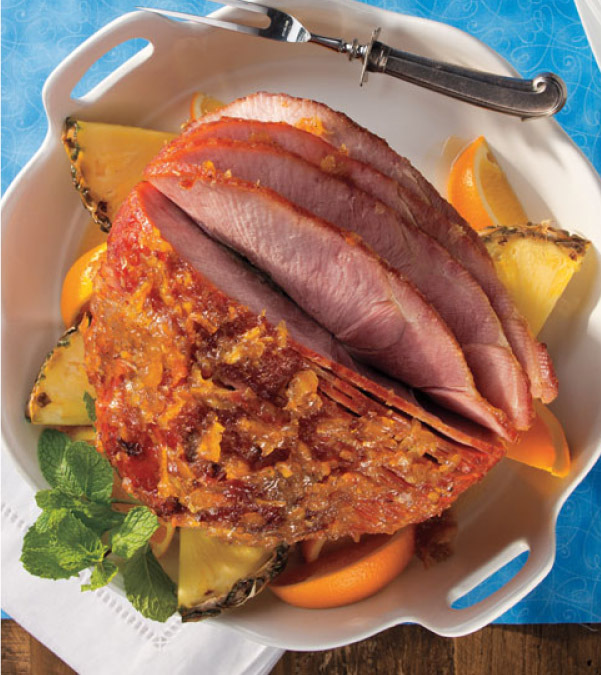 Cover ham loosely with reserved foil and let stand 15 minutes before serving. Internal temperature will rise to 140° upon standing. 4.Meanwhile, pour any drippings from 13 x 9-inch pan into same saucepan with remaining glaze; heat to boiling over medium-high heat. Boil 8 to 10 minutes or until glaze is thickened and reduced to about 1-2/3 cups. Serve ham with glaze.